The day music and tv was changed for ever. Under the sunny sky some of the 70's biggest stars were at their peaks. From one end of the globe to the other music festivals went hand in hand with the day's music scene. None other was done more effectively than California Jam. A look at the event. 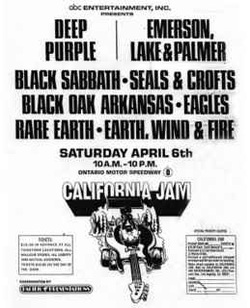 Rare Earth - Earth, Wind & Fire - Eagles - Seals & Crofts - Black Oak Arkansas - Black Sabbath - Deep Purple - Emerson, Lake & Palmer. Black Sabbath planned to go a couple days early and get some rehearsal time in. They hadn't played together since February 1974. The sound crew arrived in America to discover that there was much argument between ELP and Deep Purple. Purple wanted to go on at a specific time. To catch the perfect sunlight and dusk setting. In order to use their rainbow backdrop. Sabbath manager Patrick Meehan also got tired of dealing with all the managers. So they called off the gig, thinking it would fall apart anyway. Early in the morning Meehan and Iommi received phone calls from their crew leader Spock. Excited he explained all the fans that wanted to see Sabbath. So on a last minute flight they rushed over to the festival. The pressure was more than on them. A last minute flight, the band hadn't played together in awhile. Playing in front of the biggest crowd they have ever seen. With the cameras more in their eye sight then they had experience. With all that in mind they put out one of their best, if not the best performance of the 1970's. Thundering out Tomorrow's Dreams loud and proud. Perhaps this would be their best live version ever. But Bill and Tony tend to get a little out of sync half way through. Ozzy is really fun and engaged with the audience at this show. He seem impressed with the huge crowd. Commenting "I've never seen so many people in my life" Their setlist was Tomorrow's Dream, Sweet Leaf, Killing Yourself To Live, War Pigs, Snowblind, Sabbra Cadabra, Jam with Drum Solo, Supernaut, Iron Man, Guitar Solo, Orchid, Sabbra Cadabra (reprise), Paranoid, Embryo, Children Of The Grave. Geezer and Bill just goes off the rails with their headbanging. Ozzy with his hand clapping and overall crowd interaction is his definitive live example. In my opinion Iommi also does his best live imagery. Ozzy gave some comments on the gig to a melody maker interview. His words went like it was the most organized thing he'd ever seen. No pigs, no one arrested, and everything had backups so nothing would fall behind. And he was too nervous to get high before the show. Didn't wanna f#ck up and piss off the fans. Audio : This is one of the most commonly fan traded shows in the band's history. It has been available since 1974! The majority of these trades originate from the soundboard. While some come from the ABC In Concert radio broadcast. Which only half the show was broadcast over the radio. Making it incomplete but also contains poorer quality. It doesn't contain hardly any of Ozzy's crowd banter. You couldn't broadcast foul language over the radio like Ozzy's uses. The FM broadcast source comes from a panasonic reel to reel recording done by Scott Lifshine. There were three professional audio recordings made that day. The Tycobrahe monitor system, the Wally Heider 24-track recording vans and the ABC-TV videotape trucks. This show has been released under several 'R.O.I.O' names. The most well known would have to be 'Cannabis Confusion'. This version is the best fan made quality wise. But it is edited somewhat. 'Metal Mass' is the full show but is at about B+ quality. Luckily Wolfsgangs Vaults re-mastered the audio and the version on their website is the definitive version. Until WV released the show there was the wondering if the tape was just a really good audience recording. But WV set that thinking aside. The only complaint on the FM and soundboard sources is it's too heavy on the high end. And lacking a lot of power on the low end. Geezer is non-audible in each. While these two are copies from a single tape, it is possible that the ABC trucks record using multi-tracks. Each instrument and mic having it's own tape rolling. After all they did edit this program for tv. And hearing the tv audio the low end is better captured. Maybe it's just wishful thinking that the tapes still exist. If you look up this concert at WV it even says that the audio quality is less than stunning. Update : I've just learned that Seals And Croft gained access to the multi-tracks from ABC. In order to release a live album. But the people involved in Seals And Crofts couldn't come to a deal. So it was scraped. Giving hope to the fact that Sabbath's tapes still exist. Video : 5-10-1974 at 11:30 PM, ABC Network's In Concert began broadcasting portions of the festival. On Friday nights every other week there would be 30 minute showing. The first episode broadcasted Children Of The Grave. The 2nd episode on 5-24-1974 showed Killing Yourself To Live, War Pigs, and Paranoid. No personal copies of these particular airings are in trading. During the early 1990's Mexico tv aired black and white versions of the Black Sabbath In Concert show. Tv recordings of this made their way into trading. In the late 1990's some rare collectors were able to get a hold of pre-remastered copies of the tv broadcast. But these were kept in very few hands. The first time most fans were able to any footage of Sabbath's performance was on the Story Of Vol 1 1970-1078. Which we got a not so clear black and white view of Children Of The Grave. Along with a clip of Ozzy's interview. Later when this was re-released in 2002 the color version made it's way out. Including more of the interview with Ozzy. Around the same time the color versions of Killing, Pigs, Paranoid slipped into fan's hands. With nearly perfect picture and sound. The question is does the complete films exsist. Well for a long time the answer was up in the air. After all Deep Purple's entire performance was released on vhs and laser disc. Later on dvd with extra footage. Couple years ago someone sent me a copy of a newsletter from the old Black Sabbath fanclub where Tony Iommi answered some questions. His interview said the footage does exsist but the audio is bad in severial spots. I also seem to rememeber an interview I read online Iommi said it again. But I can't remember what site it was on. In the past couple of years there has been some most welcomed news on the Sabbath front. A complete 8mm audience film of Tomorrow's Dreams was freely released to the world. A year before that segments of Sabbath was seen on a behind the scenes 8mm film. Pre-event ticket sales went over the 2 million mark. If the planners had foresight they could have better capitalized on the growing live record movement. The 1970's had Frampton Comes Alive, Kiss Alive, Nugent Double Gonzo, plenty of legendary live albums. But that didn't come into their minds and no live album deal was struck. However they learned from that mistake and California II had a double LP released. Featuring Ted Nugent, Heart, Santana, Aerosmith, Dave Mason, Mohogany Rush, and Rubicon. The second festival didn't capture the same feel or success as the first. Blackmore's stage destruction proceeds most memories and writings of the event. The future of the footage and audio is up in the air. Which aids the specialness and mystic of the sunshine fueled day of music. Will there be another Caljam in the future. One can only ponder over why there was only these two.